“You are a nerd!” This is how my wife greets me when she gets home from work and sees me sitting on the couch playing a game on my phone. I love passing the time playing games; on my phone, computer, iPad, Xbox, board games, etc. 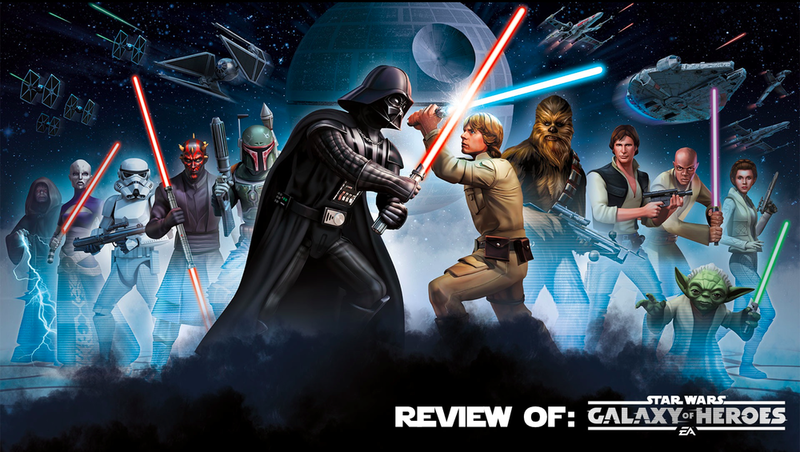 So I am excited to take a look at the App Game, Star Wars: Galaxy of Heroes. Galaxy of Heroes is a turn-based game that has a few different arenas the player can participate in. A “turn based game” is where the player makes a move and then has to wait for the computer or human opponent to take a turn. Galaxy of Heroes is interesting because you are able to collect characters from the Star Wars universe. You are able to unlock both light and dark side characters. There are specific characters like Anakin Skywalker and general characters like a stormtrooper. You are only able to unlock a character once. The player is able to have up to 5 characters in a squad and then you go out and fight. Each fight takes a specific amount of energy. The energy replenishes every few minutes and 3 different times a day you are able to get bonus energy. You are also able to purchase energy. What I like about Galaxy of Heroes is that you are able to battle with an all light side, all dark side, or a combined “neutral” team. As the player goes through the different arenas there are familiar faces in the foes. Darth Vader and Darth Sidious when you are fighting with your light side squad or Luke Skywalker and Han Solo when you are fighting with your dark side squad. Once you get to a high enough level there are a few other options for the players to participate in when the energy runs out. There are challenges where a player is able to gain more currency, training droids to level up characters, or materials to make a character’s attacks and defenses stronger. Once the challenges are met, the player is able to go on a “Galaxy War” fighting different squads without using energy but the character’s health carries over from round to round. There are a few characters that take a long time to get enough shards to unlock. These characters aren’t even fan-favorites. You are able to use simulation cards to sim battles to gain materials. Some materials take much longer to get a hold of. Even with the sim cards, it takes too long. This is one of my favorite Star Wars games I have played. I just upgraded my phone and I spent 20 minutes making sure the game would transfer over. Yes, I am married., happily married.